OptixEQ is an Internet information company that provides a high-quality assortment of handicapping products and analytical tools for handicappers, contest players, and racing enthusiasts. These products have been developed by analytical, statistical, and racing experts with years of experience handicapping and wagering on horse races. The platform is a direct output of the tools the OptixEQ products team established for their own use to handicap and wager on races. OptixEQ’s philosophy is straightforward: first and foremost, we are creating products we ourselves use every day; second, we are continually improving these products through further analysis and interaction with our client base; and third, we are innovating new products so we can help ourselves and our clients maintain an edge in an ever-changing game. OptixEQ is committed to expanding its product base over the next several years with more innovative analytical tools and platforms. Our initial platform and base set of products were built under the brand name OptixEQ. 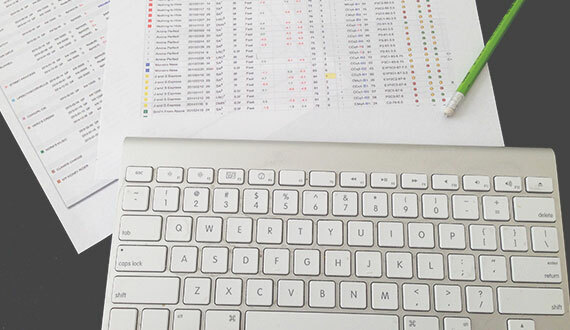 OptixGRID is the central handicapping platform and has several unique features associated with it, including OptixPLOT, OptixNOTES, and OptixWORKS. OptixPLOT is a multidimensional data-visualization tool that allows horseplayers to quickly assess the pace dynamics of a race, while at the same time, isolate strong contenders, expose weak or vulnerable favorites, showcase lone-frontrunners, highlight deep closers, and so much more. 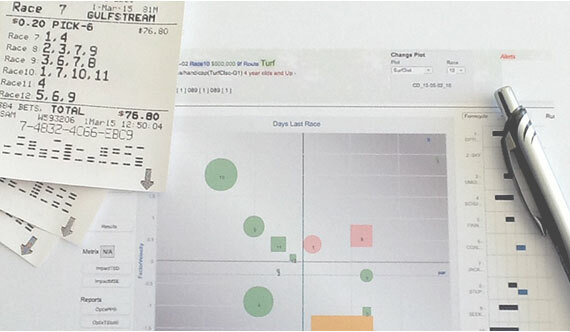 Through the use of proprietary data, OptixEQ has created a unique way of analyzing a race by comparatively plotting horses on a graph, along with their relevant running styles and their finishing ability in the race, so that players can gain an at-a-glance view of how a race is likely to unfold. 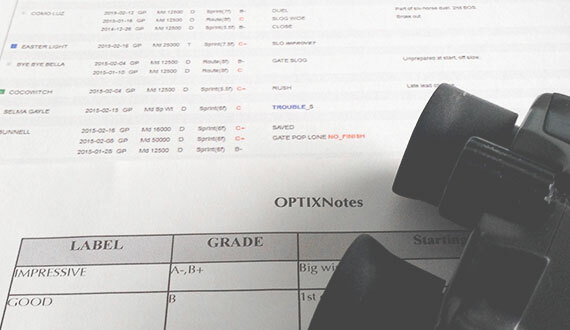 OptixNOTES is a proprietary trip-handicapping platform that includes performance ratings, form projections, and trip reports from our team of expert handicappers and race-watchers. With OptixNOTES, we have created a new, interpretive methodology for visually rating a horse’s overall performance or trip, using four core components to our methodology: “TripGrades,” “TripDescriptors,” “Form Projections,” and “Free-Form Comments.” Our experts combine their handicapping ability along with their visual expertise to create an accurate assessment of a horse’s past, present, and future performance, enabling you to isolate contenders and eliminate pretenders in a way that no other handicapping product can provide.